This paper is a review of literature on Web 2.0 uses in higher education from 2007-2009. The goals of this review were (1) to identify what Web 2.0 technologies were used in college level instruction, and (2) to examine any research evidence that Web 2.0 technologies could enhance teaching and learning. 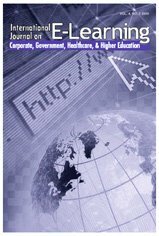 Conference proceedings from 2007 to 2009 were reviewed from four major international conferences in instructional technology: eLearn, EdMedia, SITE, and AECT. The review showed that five Web 2.0 technologies were most commonly discussed in the current literature: blogs, wikis, podcasts, social networks, and virtual environments. The findings of how each of these Web 2.0 technologies was used in higher education along with any research evidence were discussed. Liu, M., Kalk, D., Kinney, L. & Orr, G. (2012). Web 2.0 and Its Use in Higher Education from 2007-2009: A Review of Literature. International Journal on E-Learning, 11 (2), 153-179. Waynesville, NC USA: Association for the Advancement of Computing in Education (AACE). Retrieved April 22, 2019 from https://www.learntechlib.org/primary/p/34087/.